Home » Marketing & Communication Strategies, Ordering at MGX Copy, Print Design Best Practices	» What are Kinkos Postcard Printing Prices? If you own a small business and want to do some direct mail marketing with postcards, you may have wondered what Kinkos postcard printing prices are. We’ve written before about the high cost of Kinkos printing prices. But perhaps you’ve wanted to know if Kinko’s was competitive price-wise on other printing products. This article is designed to help you determine what Kinkos postcard printing prices really are. Note that this is for a postcard printing project that is fairly standard in terms of printing options. There’s no reason for you to overpay for printing! Going with MGX Copy will save you money, pure and simple. The simple way to save money is to go with an online printing company like MGX Copy. That way, instead of paying a premium on Kinkos postcard printing prices, you’ll be paying significantly less. Plus, when you go with MGX Copy, you’ll be dealing with trained printing professionals, not just someone who happens to work in a printing shop. Not only that, but if you need your postcards printed and shipped out FAST, you’ll love the Rush Critical shipping option at MGX Copy. 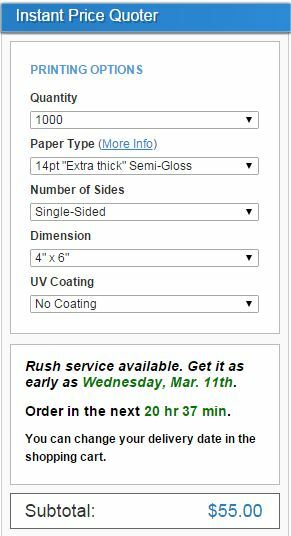 Rush critical is the absolute fastest online printing service available in the USA. Orders are generally printed and shipped anywhere in the USA same-day or next-day. Contact us today to avoid paying outrageous Kinkos postcard printing prices! Don’t overpay on your postcards! Contact us today to save up to 85% off the cost of Kinkos postcard printing prices! Instead of settling for the long lines and unhelpful staff at the print shop down the street, go with a printing company with a reputation for quality and service like MGX Copy. « Where can I print real estate postcards for cheap?